Great curb appeal! Enter through the landscaped courtyard into this warm and inviting home. You will notice many great features including newer tile flooring in the entry and family room, carpeting in the living area and bedrooms, the family room off the kitchen has lovely French doors with venting side windows for beauty and comfort, the kitchen boasts SS appliances and granite countertops. The north-facing covered large patio is extended leading to a landscaped and fenced back-yard. The exterior was painted in 2017 and the AC/furnace was replaced in 2015. The spacious garage extended about 10' for extra storage and golf cart parking, plus it has an insulated door, work area and cabinets. 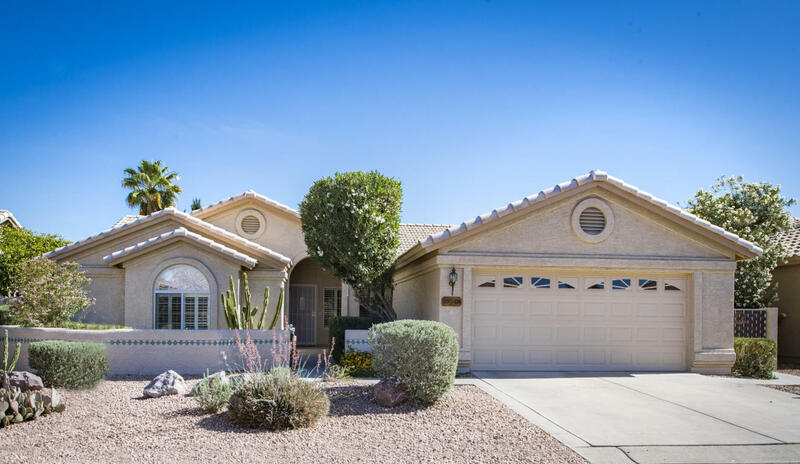 Enjoy living in an active, friendly community with many amenities includinggolf, tennis, pools, pickleball, softball, many clubs, arts and crafts, entertainment, restaurants plus so much more!